Tom Regan practices in the areas of real estate, energy, telecommunications, land use, health care and administrative law. He represents major corporations, private developers, institutions, and not-for-profits in the development and financing of commercial real estate projects and energy and telecommunications facilities. He also represents national clients on permitting, administrative law and real estate litigation matters throughout the State of Connecticut. Tom is recognized in the categories of Real Estate Law (2010-2019), Real Estate Litigation (2011-2019) and Energy Law (2012-2019) by Woodward/White’s The Best Lawyers in America. 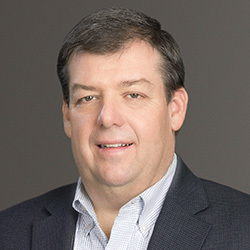 Tom served as the Senior Vice President of Economic Development and Governmental Affairs for the Greater New Haven Chamber of Commerce where he was responsible for the leadership and management of those departments. Tom also has extensive experience in legislative and public affairs. Represented major health care institution in the divestiture of certain long term care assets, including obtaining the necessary governmental approvals and negotiation of both the purchase of both the assets and the business interests. Representation of various telecommunications providers and tower owners in developing over 500 telecommunications facilities throughout Connecticut including negotiating leases, options and easements; obtaining necessary zoning, land use, environmental, historic, and wetlands approvals; resolving title and utility access issues; and developing related litigation strategies as necessary. Represented a major real estate investment fund in connection with the purchase and sale of shopping centers throughout the United States. Since 2002, Tom has represented their developer entities in the acquisition, financing and disposition of shopping centers comprising approximately 1,000,000 square feet, with a total value in excess of $100 million. Represented an international real estate investment company in its conversion of several apartment complexes in Hartford and New Haven, Connecticut into condominiums, the first conversion in those cities in more than 15 years. Involved in the negotiation, drafting and preparation of the Public Offering Statements, Declarations and related condominium documents to convert the apartments into condominium units, both residential and commercial. Represented a major real estate developer in the acquisition and financing of 80 acres in Stamford for one of the largest residential mixed use urban developments in Connecticut. The project involves, among other elements, significant environmental remediation, complex debt and equity financing, and multilevel governmental approvals. Represented a national home builder in its development of multiple projects in Connecticut. Our work has included acquisition of sites and obtaining the necessary approvals from multiple governmental authorities. Selected by his peers for inclusion in The Best Lawyers in America© in the fields of Real Estate Law (2010-2019), Real Estate Litigation (2011-2019) and Energy Law (2012-2019). 2010 Agnes Ohlson Award for Outstanding Contribution to Nursing Through Political Action, Connecticut Nurses Association.